Between now and September, NASA's Cassini spacecraft will engage in its most daring and breathtaking flybys of Saturn and its rings yet, passing between the rings' inner edge and the cloud tops of Saturn. Last month, Cassini made blockbuster news when NASA scientists announced the detection of life-nourishing chemicals in plumes of water vapor erupting from within the tiny moon Enceladus. 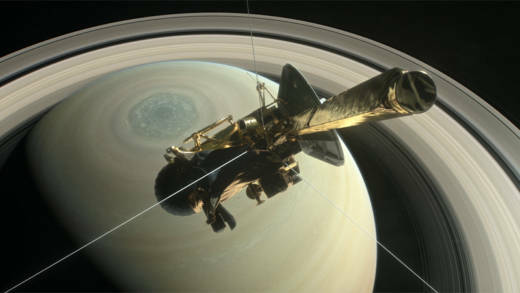 It comes 13 years after the robot started an epic career exploring the Saturn system. Since early in Cassini's tour, a billion miles from the sun, evidence of liquid water on Enceladus has tantalized our curiosity. In 2005, Cassini discovered plumes of water vapor erupting from crevasses in the icy crust of the tiny moon. Later, Cassini passed through one of the geyser plumes and detected traces of ammonia, which provided more hints of what's going on below the outer icy crust. 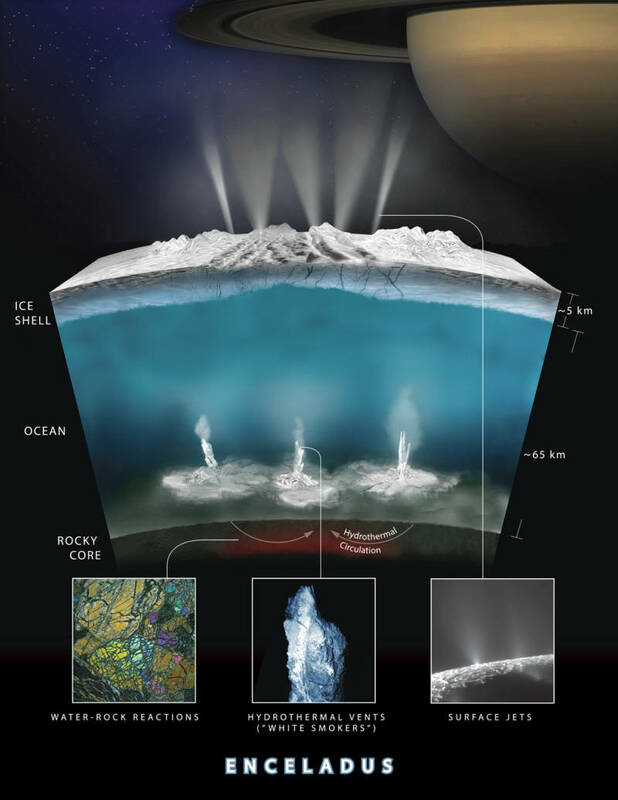 Further measurements suggest that the source of Enceladus' chemical-tainted "geysers" is probably a hidden ocean. And now, the detection of molecular hydrogen in the plumes points to the likelihood that there are hydrothermal vents on the ocean floor, spewing out heat and chemicals from the moon's deeper interior. 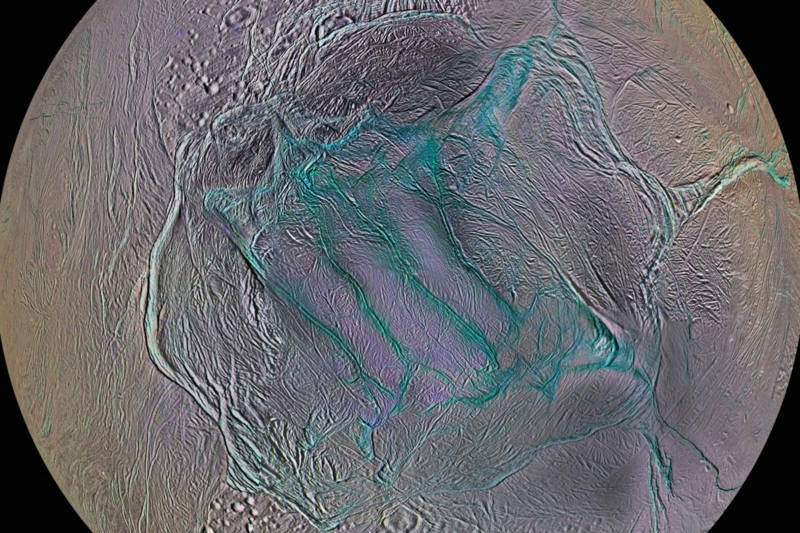 Enceladus is too small to have retained molecular hydrogen from its formation in its outermost layers of ice and water, so the source likely comes from supplies trapped deeper within. Hydrothermal vents on the cold, dark floor of Earth's ocean supply the heat and chemical fuel for thriving communities of lifeforms, so Cassini's discovery increases the chances that Enceladus might support life. The news of life-nourishing chemicals on Enceladus comes after Cassini's final close flyby of the moon, as Cassini steers into a trajectory that brings it daringly close to Saturn and its rings, and toward a planned burn-up in the gas giant's atmosphere in September. Why is NASA deliberately driving its flagship planet-exploring robot toward a fiery end-of-mission incineration? The answer, in short, is that Cassini's rocket fuel is almost depleted. Once its fuel tanks run dry, NASA will no longer be able to control the spacecraft's trajectory, and it would become a derelict, bearing radioactive Plutonium-238 in its electrical generator system. With the possibility that some form of life exists on at least one of Saturn's moons, NASA is opting to safely destroy Cassini rather than risk it crashing onto a life-bearing world. In fact, Cassini's initial launch from Earth about 20 years ago raised protests from some, who felt that the risk of a launch explosion that would spread Plutonium through Earth's atmosphere was unacceptable. Fortunately the launch was a success. Now, two decades later, a burn-up on Saturn will close this chapter of space exploration that includes a plethora of breathtaking discoveries. Finding water and signs of a life-friendly environment on Enceladus are not the only things Cassini revealed in the Saturn system. Early in its mission, in 2005, Cassini deposited the European probe Huygens onto Saturn's largest moon, Titan, the first—and so far only—landing on a moon other than Earth's. 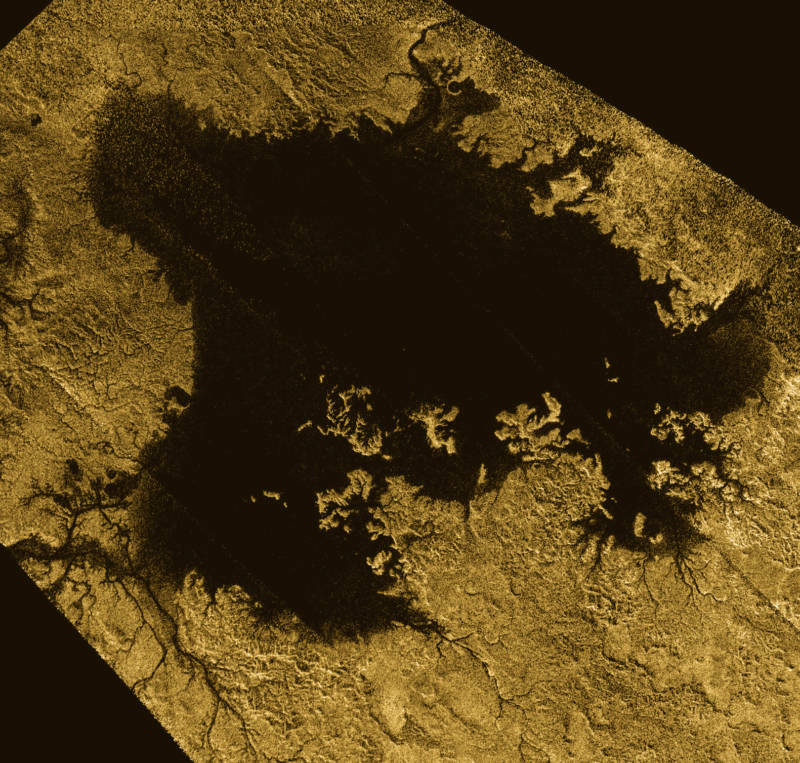 From the atmospheric data collected by Huygens, and optical and infrared pictures taken by Cassini during flybys, Titan has been revealed as a fascinating world. Though its surface and atmosphere are cold in the extreme, Titan possesses an atmosphere of mostly nitrogen that is thicker than our own, with a dense shroud of methane and ethane "smog." Even more incredible—Titan's atmosphere supports a cryogenic liquid cycle analogous to Earth's water cycle, but with rain, rivers and lakes composed of liquid methane. And, deep under Titan's solid crust there may be an ocean of liquid water. Cassini made its last close flyby of Titan on April 22. Cassini's other accomplishments include investigating Saturn's varied and unique moons, the complex patterns and icy dust composition of its ring system, and exploring the gas giant Saturn itself. 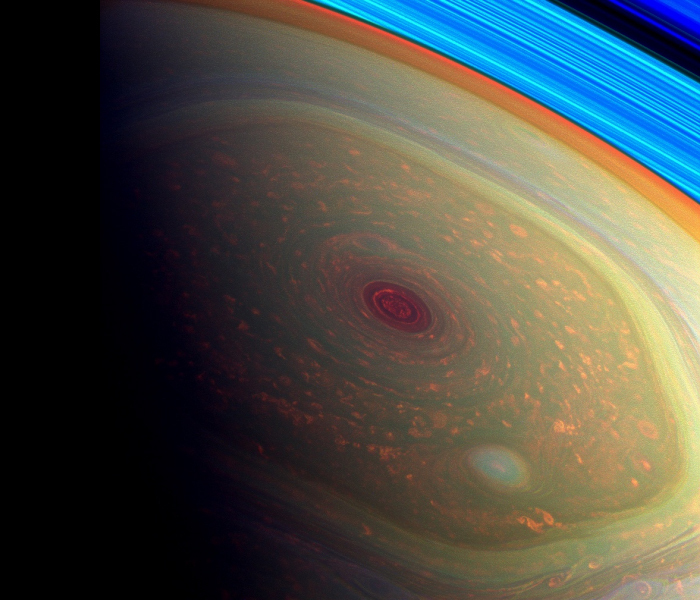 Saturn's atmosphere is a dazzling and complex environment of swirling storm systems, cloud belts, aurora activity, and an enigmatic hexagonal cloud cell centered on its pole. As Cassini enters its final orbits that will carry it within the ring system, through Saturn's upper atmosphere, and then finally to its terminal plunge through Saturn's skies, the spacecraft will collect and transmit data to Earth about the rings and atmosphere that could never be achieved from wider, less risky trajectories. Scientists hope to learn more about Saturn's magnetic and gravitational fields, which can give insights into Saturn's interior structure and dynamics. Closer inspection of the rings will give us a better assessment of how much material they contain, and stronger clues to how they originally formed.